The curved screen has attracted considerable attentions in recent years, since it enables to enlarge the view angle and to enhance the immersive perception for users. However, existing curved surface projections are frequently prone to geometric distortion or loss of content. 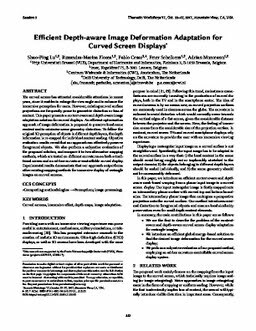 This paper presents a content-aware and depth-aware image adaptation solution for curved displays. An efficient optimization approach of image deformation is proposed to preserve local scene content and to minimize scene geometry distortion. To follow the original 3D perception of objects in different depth layers, the depth information is re-mapped for individual content scaling. Objective evaluation results reveal that our approach can effectively preserve foreground objects. We also perform a subjective evaluation of the proposed solution, and compare it to two alternative mapping methods, which are tested on different curvatures on both a traditional screen and an ad-hoc curvature-controllable curved display. Experimental results demonstrate that our approach outperforms other existing mapping methods for immersive display of rectangle images on curved screens.